Fourex Brewery wanted to brand their new Alehouse Bar & Restaurant. Keeping with their heritage and industrial look they requested black painted steel letters that they wanted to be backlit to illuminate at night. Also important was the round barrel head Brewery logo. The bricks the sign was to be mounted to are a pale orange to cream colour and they requested a warm white light. We positioned 3000K LEDs on the back of the larger letters. Because the smaller Restaurant letters would not easily accommodate LEDs we made up a steel edged light tray and lit it from top and bottom. When viewed from the entrance, the top row was too visible, so we changed to a double row of lights along the bottom where they were easily concealed. The round logo needed the bright white illumination to highlight the dark red background and we used just ten side lit LEDs to achieve this. 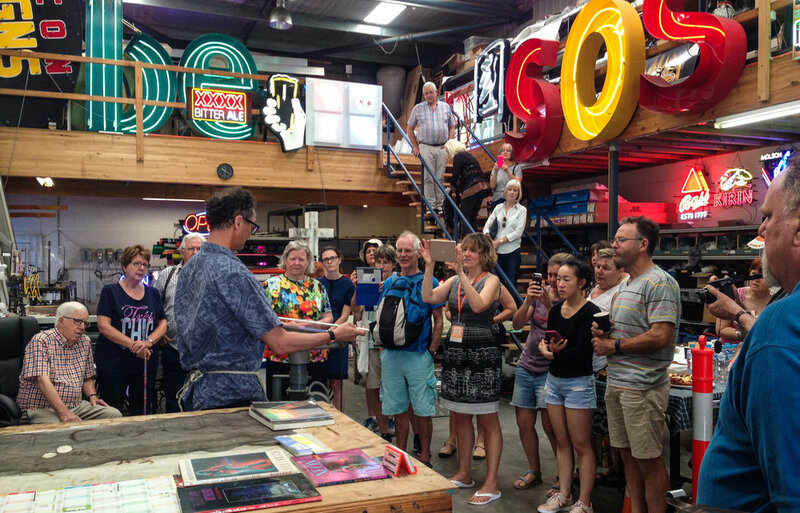 Neon Signs Australia and Michael Blazek hosted nearly 50 neon enthusiasts last Saturday and Sunday as part of Made In Brisbane, a special feature from the 2016 Brisbane Open House. Vintage and restored neon signs glowed from the balcony, including eight recently acquired American beer signs, a Mr. Fourex glass of beer, and reclaimed turquoise neon letters from the Ibis Hotel. 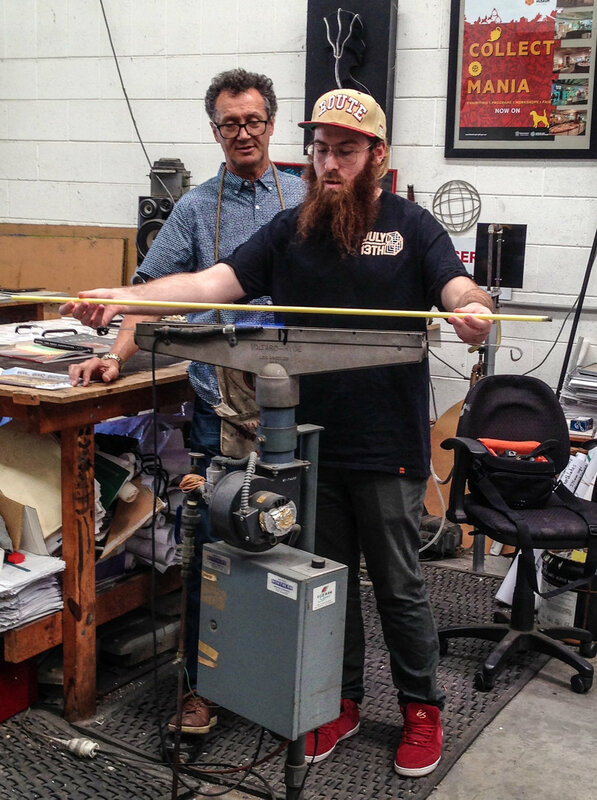 Michael explained the finer points of how different colours are achieved, demonstrated how the glass is bent and the gases, neon and argon, are processed to create the brilliant rainbow of neon colours. Griffith University Back in Action! After the mess of the 2014 hail storm, the Griffith University had all of the faces on their two signs damaged. All of the black University and silver Queensland faces were hand-cut from aluminium composite and attached to the existing letters. The 96 neon tubes were replaced in the refurbishment as they were over fifteen years old, but still working. We were contracted by 5th Star Rope Access, who took all the letters down and re-installed them at the Southbank campus site. Australia's youth can now continue to be enlightened.